The Mission Special Edition program has finally gotten off the ground, and it is already having a significant impact on special needs children and their families in the Phoenix area. After a number of years in the planning stages, the program took a giant leap forward in early November when director Brandi Goltz and head coach Rod Rihela – along with a number of others from the Mission AZ family and volunteers – organized an equipment drive that brought in mountains of used skates, sticks, pads and other gear to outfit players who mostly had never skated in their lives. The group then organized a fitting day in which each player made their way around the locker room and filled gear bags with everything they needed. 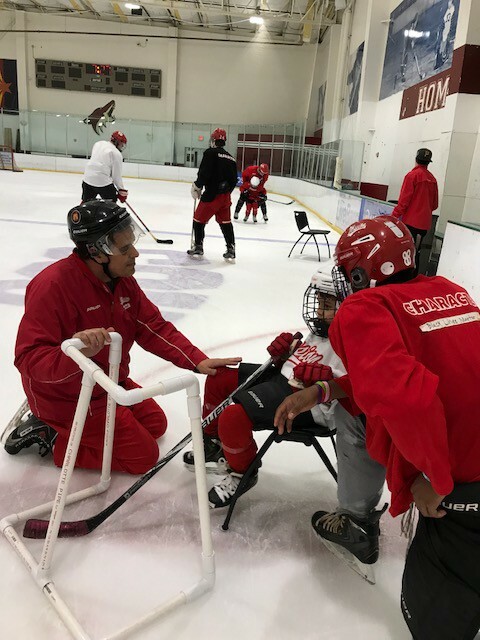 On Nov. 16, Rihela guided 14 kids through the program’s debut on-ice session, and by the following week, there were 20 participating. – from ages six to 16. 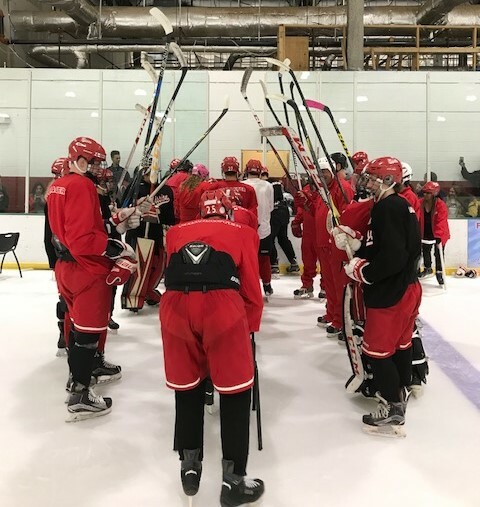 Players from Mission’s Bantam and Midget teams served as mentors during the 30-minute sessions, which are scheduled to be held approximately once a week throughout the hockey season. “The goal of the program is to give kids who would never otherwise have the opportunity to be part of a hockey program a chance to enjoy the sport and learn what we consider to be the greatest game in the world,” said Rihela, whose 12-year-old daughter is participating in the Special Edition program. “We want to expose them to something they normally wouldn’t have a chance to experience. Rihela said that while the reaction of the kids was priceless, he was even more moved by how thrilled the parents were to see their children trying something new and expanding their horizons. 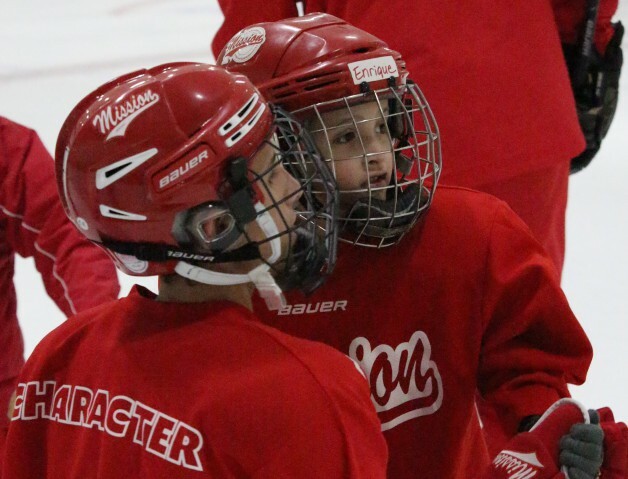 Beyond the opportunities that are being provided for the special needs players, Mission’s Bantam and Midget players have grown as well in their roles helping the Special Edition players on the ice. They’re learning lessons about compassion, helping others and teamwork that are more impactful than perhaps anything else they have experienced. Rihela said that at a recent session, one of the 16U players approached an assistant coach and thanked him for letting his team work with the Special Edition players. The experience has also reinforced in them that they’re extremely fortunate to have been blessed with the gifts that they have, as well as to have the opportunity to play hockey at a high level. “All it took was a few minutes for them to get comfortable working with the Special Edition kids,” Goltz said. “They really leaned into this – they didn’t just go through the motions, and they got every bit as much out of it as the Special Edition kids did. Next on the horizon, Rihela hopes to be able to organize some cross-ice intrasquad games. Skill sessions will be incorporated into practices for some of the players who are more advanced. He said he’s looking forward to watching the kids grow as hockey players and involving more kids in coming weeks. “This could be one of the greatest things I’ve ever been a part of,” Rihela beamed. “We’re changing how kids and families look at the sport and how they can participate in it. I’ve had parents stop me in the locker room and tell me how they can’t wait until next week.